introduces into circulation the postage stamp issue dedicated to this event of high importance for our country. Romania started its way to the European Union on February 1st, 1993,when the EU-Romania Association Agreement was signed. Our country formally applied to join the European Union in June 1995, and in December 1999, the European Council decided to open accession negotiations with Romania, along with six other states. Negotiations were opened on February 15th, 2000 and were technically concluded at the Accession Conference held at ministerial level on December 14th, 2004. The decision was endorsed by the BruxellesEuropean Council of December 16-17th, 2004. On April 25th, 2005, in Luxembourg, the Treaty of Accession of Romania and Bulgaria to the European Union was signed by the two states and by the representatives of the Member States of the European Union. Following signature, the Treaty was submitted to ratification in all Member States, and Romania became a member of the European Union on January 1st, 2007. From January 1stto June 30th, 2019, Romania will assume, for the first time, the Presidency of the Council of the European Union. This commission is taken over by rotation among the Member States of the European Union, every six months. During the exercise of the Presidency, Romania will represent the Council of the European Union in dialogue with the other European institutions, in particular the European Commission and the European Parliament, also working in close coordination with the President of the European Council in the decision-making process. The rotating Presidency ensures the day-to-day management of the European agenda and the presidency of the Council’s sectoral formations at all levels (ministerial, ambassadorial and technical), with the exception of the Foreign Affairs Council. The Presidency should act as an impartial mediator, focusing mainly on the presentation of compromise proposals, capable of leading to the adoption of common positions of the Member States. The Romania’s Presidency of the Council of the European Union will take place in a complex European and international context, its political agenda being closely related to the development of some files playing for high stakes at European Union level. In order to ensure the continuity of the work of the Council of the European Union over a longer period of time, the Member States holding the Presidency work together, in groups of three, called Trio. This system was introduced by the Treaty of Lisbon in 2009. Romania will open the Trio of Presidencies, which also includes Finland and Croatia. The mottoof the Romania’s Presidency of the Council of the European Union, “Cohesion, a common European value”, is a clear message of support for the European family cohesion, but also for policies that stimulate economic, social and territorial convergence. 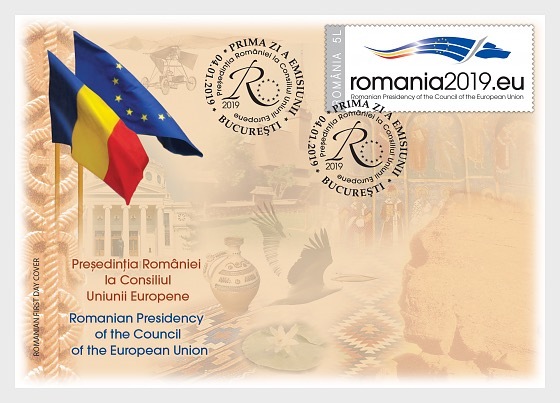 The stamp of the issue, with the face value of Lei 5, illustrates the logoof the Romania’s Presidency of the Council of the European Union, resulting from a creative contest won by Ioan Dobrinescu, a 9thgrade student from “Ion Luca Caragiale” National High School in Bucharest. The logo indicates a moving, self-assured, dynamic European Union, but at the same time attached to its values. The European Union was illustrated by means of a wolf, an animal present in the mythologies of most European cultures. In addition, the drawing illustrates a European Union that affirms its attachment to the protection of biodiversity. Romfilatelia thanks to the Ministry of Foreign Affairs for the documentary and photographic support granted for the achievement of this postage stamp issue.